Svetvinčenat, Savičenta, San Vincenti, three names of one place, all derived from the name of the patron, the Hispanic martyr St. Vincent and the abbey of the same name around which a small town has developed. The area has been inhabited since prehistory and Roman times. The beginnings of Svetvinčenat are related to the monastery of the Benedictine monks from Ravenna on the location of the Church of St. Vincent on the cemetery. The first smaller settlement grew there. It is mentioned in the document written by Oton II (983) as the property of the Bishop of Poreč. In the 13th century, when the family Castropola from Pula took over the feud (1211), the new urban centre became the fortified building where the steward lived, but Svetvinčenat is mentioned as an abbey back in 1325 in Istarski razvod. After the Costropolas, owners were families Morisini and Krotendorf and the Bishop of Poreč. The Morosinis finished the castle restoration in 1485 and started the transformation of the place into a regularly organised Renaissance settlement with a square and water well in the middle, surrounded by the Parish Church and loggia and other public and residential buildings. In the 16th century the castle came into hands of family Grimani di Luca. As a fortress, the castle existed in the second half of the 13th century. Its transformation into a castle ended in 1485, and it has not changed significantly, not even after the fire in 1856. Its interior consists of a palace, which partly dates from the 14th century. The castle was a very important fortress for Venetian army; it was repaired in 1907 and thoroughly renovated in 1933. Svetvinčenent square, the popular Placa, pleasantly surprises every visitor with its authentic Renaissance appearance, harmonious architectural proportions and simplicity. Placa is surrounded by the castle with towers and palace, the Parish Church of the Annunciation, town loggia from the 18th century, and the whole range of 16th century Renaissance houses, and in the middle of Placa there is the town's water well made in 1808 of dressed stone with the contributions made by common people. The stone castle Grimani, the best preserved castle on the peninsula of Istria and the largest Svetvinčenat building, stretches over almost the entire north side of Placa. The castle used to be the destination for tradesmen, soldiers, aristocracy guests and travel writers, and today it attracts curious passer-bys and tourists. The first fortress was built in the early 13th century, but the stormy war years resulted in destruction quite often, which implied the reconstruction and the change in the castle’s appearance. Apart from the appearance, it also changed its owners. After bishops and families Castropola and Morosini, the ownership over the castle was gained by the Grimani di San Lucas, patrician Venetian family. Its present appearance the castle took in 1589 when Marino Grimani renovated the burnt castle according to the design made by Venetian architects Scamozzi and Campagne. The castle is today one of the most beautiful Venetian buildings of that time in Istria. On its three corners there are three towers, and the fourth is the palace for gentlemen and a flat for the captain. From these towers all four entrances to the town were controlled. The towers are connected with fortress walls which also have a supporting wall at the bottom, and from the inside it is a balcony throughout its length from which the guards observed through loop-holes. On the gate, apart from the drawbridge, there was also a big railing used for the descent. 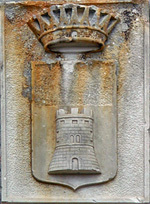 Above the entrance there is the castle’s coat of arms, which is the present coat of arms of Svetvinčenat and coat of arms of family Grimani di San Luca. The castle had a large yard, an apartment for the town steward, a warehouse for payments in kind and ammunition, rooms for 200 musketeers and lancers and a very safe prison – under the ground. 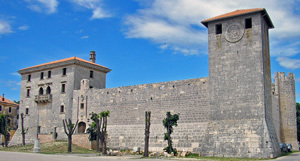 In the 19th century the Grimani family made the castle over the bishops, and they gave it to the municipality early last century. In the World War II the castle was burnt one more time. Copyright © 2011 The Svetvinčenat Tourist board .